Why inspect common property? That’s the associations responsibility! What’s All the Fuss about IR Thermal Imaging ? The first seven items are generally able to be given a basic assessment prior to submitting an offer and hiring a home inspector. This can save you time, frustration and money. In the following blogs I will be posting a process you can use to do a quick initial assessment of most of these items with little time and effort. Then if you are satisfied you can move forward with more confidence. Most of us have heard about Meth labs found in homes. Have you watch the cable show Breaking Bad? Meth labs leave behind seriously hazardous chemicals in the flooring, walls, ceilings and heating/cooling duct works. These chemicals can cause serious health issues if not removed prior to occupation. These include respiratory issues, kidney problems, headaches and more. Many of these can become chronic conditions. So how do I recognize the signs that a meth lab has existed in a home. The best way is to simply have it tested. Also, you can check with the County to see if it has been recorded in the registry listing known meth lab locations. However, it is possible for a house to not be recognized as a meth house even though one existed there. I have recently inspected a foreclosed home that revealed multiple clues that brought me to the conclusion that it had very likely been a meth lab at one time. The property had been cleaned up. Several rooms had the drywall removed, all the doors were removed, the entire place had been sprayed white, a heavy black residue coated the interior of the furnace blower compartment, large sections of the heating ductwork had been removed, a toilet was missing (easier to dump the waste), all the original hardwire smoke detectors were missing, the bottom and top of the furnace flue had been removed (a good place to run an exhaust pipe) and the concrete floor had reddish brown stains. Any one of these on its own would not indicate a lab. However, all of them together indicate that a clean-up crew came in and attempted to remove (or cover-up) the evidence of a meth lab. You may think that the house should be o.k., the place is clean. However, the property was not listed with the county as a know meth lab. Therefore, there is no way to know if all the proper procedures were followed to ensure a safe environment. 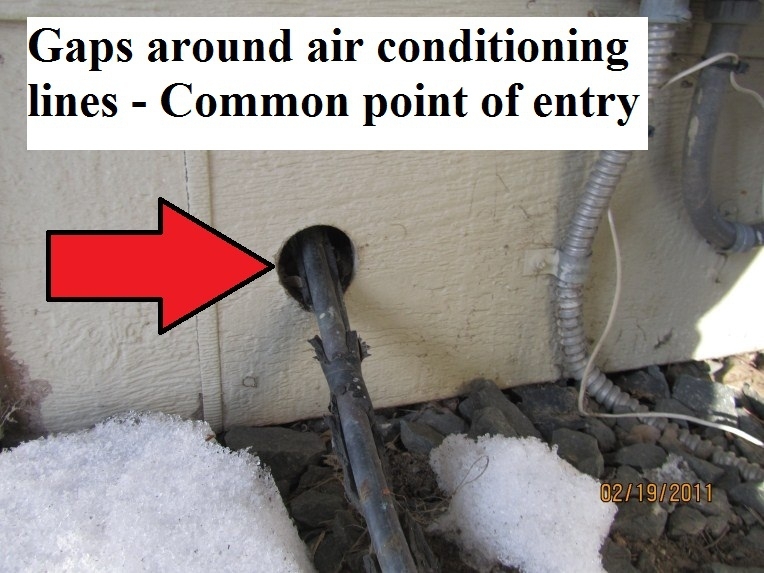 They clearly did not clean the furnace and duct work properly. There sellers, (a bank), did not disclose the problem. Consequently, to ensure that the house is safe a full assessment must be done on the property. The cost of initial testing would be $500.00 – $1,000.00. Clean-up could be in the 10’s of thousands. When looking at foreclosed properties in particular or past foreclosures that have been "flipped", do some research and inspect carefully. 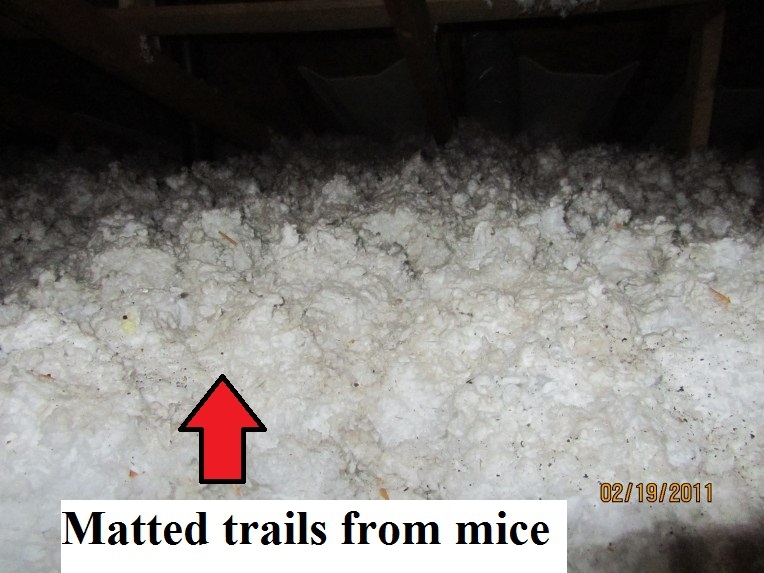 Many, even most of the homes I have inspected recently have pests, generally mice, in the attic and other areas of the home. For those of you who have battled the problem for years with little permanent success, there is hope! A good trust worthy exterminator can cure the problem. A good exterminator will start with meticulously filling ALL the possible entry points around the perimeter of the home. This will generally take several hours and possibly several trips. If your exterminator spends 30-40 minutes setting out some poison and fills one or two holes around the home, they probably are saving some work and revenue for a few months from now when you call back with the same problem. A good job takes time and generally a great deal of filler. 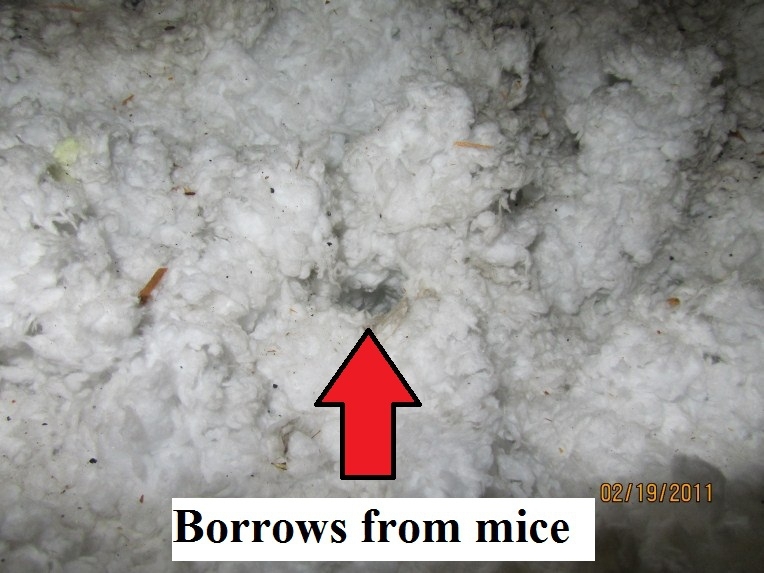 Mice can fit through a gap of less than 1/4" or through a hole less than 3/8" diameter. There are many openings around the exterior of a home that are large enough to let mice and other critters in. When seeking out an exterminator, find one who will do a thorough job, NOT the cheapest one. Hiring the cheapest one can cost you the most money and aggravation because you will have to call them back over and over again and never completely solve the problem. 1) To describe the services they provide for the quoted fee. Note: It has been known that some unscrupulous exterminators will fill a few hole but intentionally leave opening to ensure repeat business. Although this is not mice it is an interesting photo of a recent find. 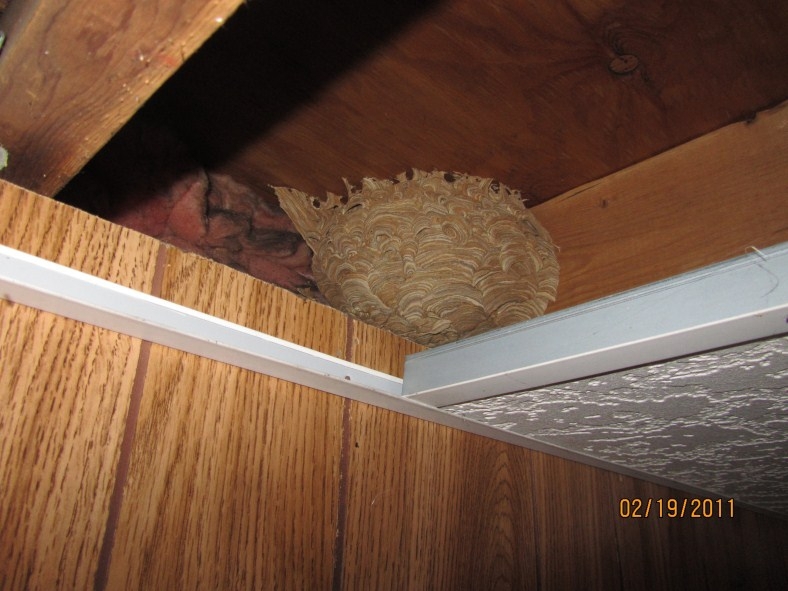 A wasp nest that was built above the suspended ceiling in the floor joist of a home. Daddy’s role in the home Inspection Process Some of my favorite inspections are when daddy is present to help his daughter with the transaction. Most often he is daddy the protector. As I walk the daughter through the home she often turns to daddy for a confirming node or with a look that says “you understand this, right dad?”. Usually, at about the half way point the daughter and her agent wander off and dad and I finish the walk though. As a father myself, I think it is great when a daughter trusts her dad so much (at least with this kind of decision, probably would not trust him to approve her next boyfriend :-). Father daughter relationships are extra special and precious. Daughters, if you can, give your dad a big hug today.